The challenge saw teams from Abu Dhabi University, Amity University Dubai, Canadian University of Dubai, Middlesex University Dubai, the University of Sharjah and Zayed University, respond to a communications brief set by Expo 2020 – a World Expo to be hosted by Dubai in October 2020 – and take part in a live pitch to a panel of senior industry professionals. 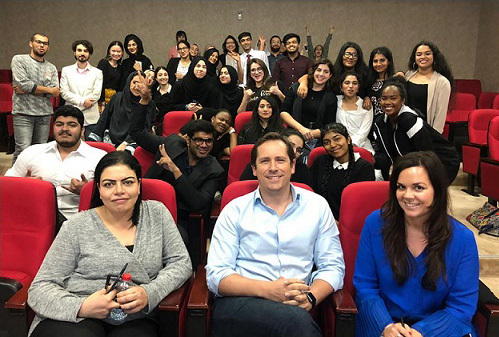 Ahead of the pitch challenge on March 23, participants heard from experienced PR professionals on how to dissect a brief and develop a communication strategy, before the EXPO 2020 team delivered their live brief. Students were given less than three hours to research and prepare their communications proposals. The nine teams then had 15 minutes each to deliver their pitch presentation to a panel of judges and fellow challengers. After careful deliberation, judges – which included Salam Nemer from Expo2020 Dubai, Kirsty O’Connor from Hill+Knowlton Strategies MENA and Peter Ganney from Performance Communications ME – reached a unanimous decision on who would take home the inaugural title: Project Unite from Middlesex University Dubai was named as the inaugural MEPRA Student Pitch Challenge champions. One of the team members said: "We are so happy that we get to end the day on this note." Another added: "When you go into an industry looking for a job, this tells you that you are capable. That you are going to be someone." The MEPRA Student Pitch Challenge was part of the MEPRA Student Chapter; which focuses on meeting the needs of students and graduates as they prepare to enter the communications profession. Through this programme, student members grow their network, build knowledge through focused workshops and gain access to industry resources and training to further develop their skills prior to entering the workforce. Student Chapter members have access to internship opportunities with some of the region’s top communication consultancies and corporate teams through the MEPRA Student Member Portal.